CUPRA Ateca – the first model to be launched under the new brand – has opened for UK buyers to order. A unique model in the market, CUPRA Ateca offers the highest performance of any SUV available outside of premium manufacturers. It will launch with a standout inclusive package and a recommended retail price of just £35,900 OTR with a high level of standard spec, metallic paint and CUPRA Care service and maintenance included. The sophisticated design boasts sporty yet elegant features including CUPRA body styling, exclusive diamond cut alloy wheels, glossy black exterior details, and the striking new CUPRA logo and lettering. Offering the precision and sportiness expected of a CUPRA, this car will give customers a unique proposition: high performance and sporty design combined with the practicality of an SUV in a simple and affordable package. The CUPRA Ateca’s 2.0 TSI engine delivers 300 PS and 400NM of torque. This technologically advanced engine works with a newly designed Otto Particulate Filter System to fulfil the latest Emission Legislations. This engine comes with a powerful sound, and is equipped with a newly developed DQ381 7-speed DSG gearbox that has been developed to offer sportier gearbox feel with faster, smoother and more precise changes. The gearbox’s development has been modified to combine excellent performance with efficiency. 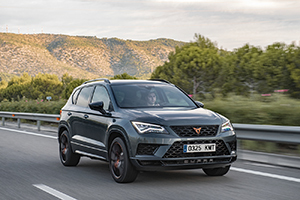 The CUPRA Ateca comes with the 4Drive traction system which analyses road conditions in real time, including the speed of the car, speed of each wheel, the steering wheel position, and the driving style or mode to quickly and progressively deliver power at each moment to the necessary wheels. The 4Drive system is optimised to work together with all the driving modes: Normal, Sport, Individual, Snow, Off-Road and, of course, the CUPRA mode. When selecting the CUPRA mode in the Drive Profile, the engine reacts immediately with a refined sound, and the adaptive suspension (Dynamic Chassis Control) setup is adjusted to give a sportier edge to the car. Glossy black details are a constant on the exterior of the CUPRA Ateca: the roof rails, wing mirrors, window frames, side mouldings, wheels, front grille, front and rear diffusers and spoilers. Other elements bring out the exclusive personality of the car; the welcome light that shines the CUPRA name and logo onto the ground. There are six exterior body colours available: Energy Blue, Velvet Red, Brilliant Silver, Rodium Grey, Magic Black and Nevada White. The interior is as sophisticated as the exterior, with the standard specification featuring a leather sports steering wheel with copper stitching and CUPRA logo. The black Alcantara seats also feature copper stitching and an embossed logo, and are complemented by Alcantara door panels. The pedals are finished in aluminium and the climate control air vent frames and the central console are finished in gloss black. With a low centre of gravity and a suspension system that perfectly combines efficiency with progressive, rapid and precise power steering, the new CUPRA Ateca comes with exceptional dynamic behaviour and fantastic ride quality. It can reach a top speed of 153 mph and go from 0 to 60 mph in only 5.2 seconds. Care package includes the first three manufacturer scheduled services, featuring a brake fluid change, plus the vehicle’s first MOT. Additionally, there is European roadside assistance coverage and maintenance jobs including brake repairs, wiper blades, air-con service and key batteries, as well as repairs to essential areas including engine, transmission, suspension, electrics and cooling. A small number of options will be available including a Comfort & Sound Pack featuring BeatsAudio sound system and Advanced Driving Assistance Pack; Design Pack (with 20” Diamond cut copper alloy wheels and Brembo brakes); panoramic roof and tow bar. For Q1 next year, 25 CUPRA specialist dealers will offer a more tailored experience to CUPRA customers, although the model can be ordered from any SEAT dealer. The standard equipment in the CUPRA Ateca is oriented towards three basic principles: technology, design and safety. That is why systems such as the keyless entry and start system, wireless charger, 8” touchscreen navigation system plus, dynamic chassis control and park assist all come as standard. with the launch of new models, CUPRA will also keep the motorsport and racing spirit alive by participating in the TCR series. The CUPRA world is alive and ready to conquer a new group of enthusiasts in more than 260 specially selected SEAT dealerships all across Europe.